Hello Everyone! 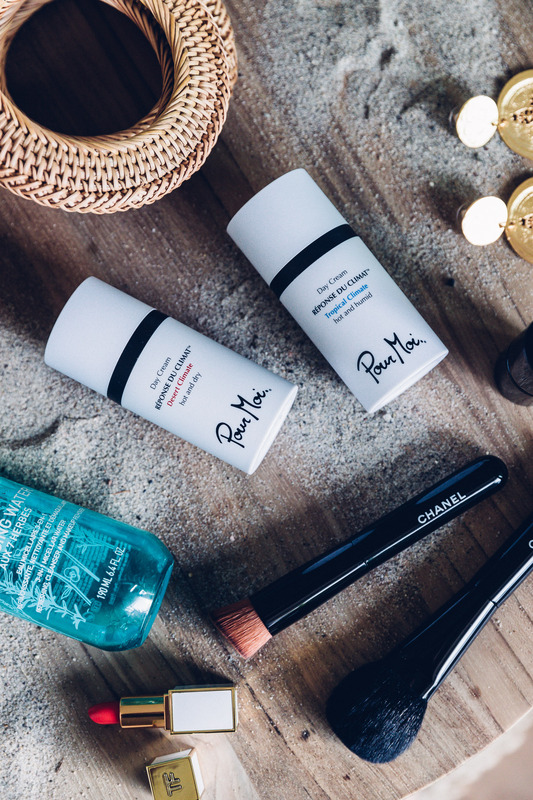 Since I’ve been traveling quite a bit, especially as of late, I thought I’d dedicate today’s post to my favorite beauty products to travel with. 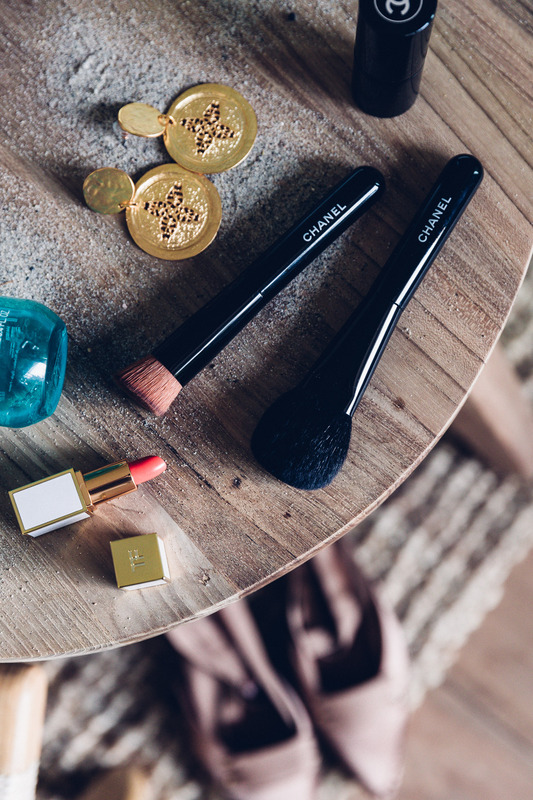 Generally speaking, when it comes to my beauty on the go must-haves, multitaskers otherwise known as products I can use in multiple ways, is what I aim for. Packaging is another thing I always consider: compact, easy to pack and use is the name of the game. Last but certainly not least is of course performance. 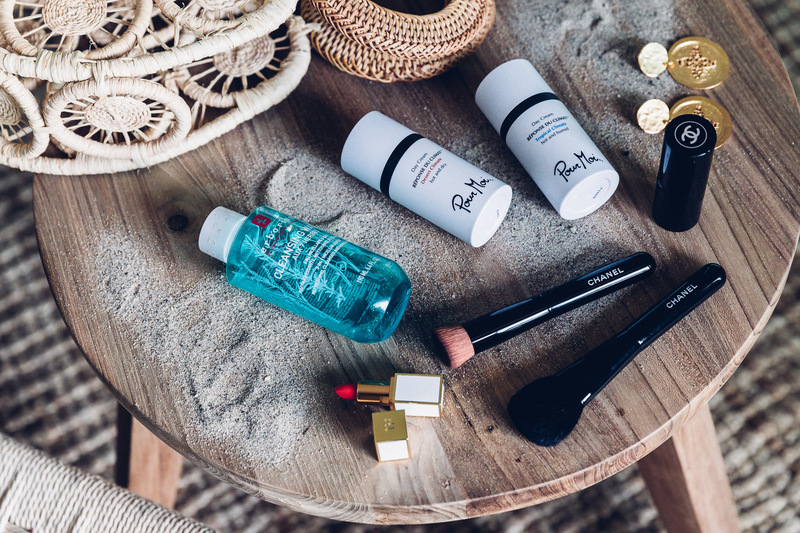 When I’m at home, there is absolutely nothing I love more than trying new beauty goodies, but when it comes to travel, I am not particularly fond of surprises, so I generally go for time-tested favorites that I know will get the job done! Erborian Cleansing Micellar Water – I absolutely love traveling with this product because it can do so many things – it’s a makeup remover, toner, and refreshing water that is moisturizing without being greasy. I love that it’s a product I don’t need to rinse off and I like easy to use products while on the go. 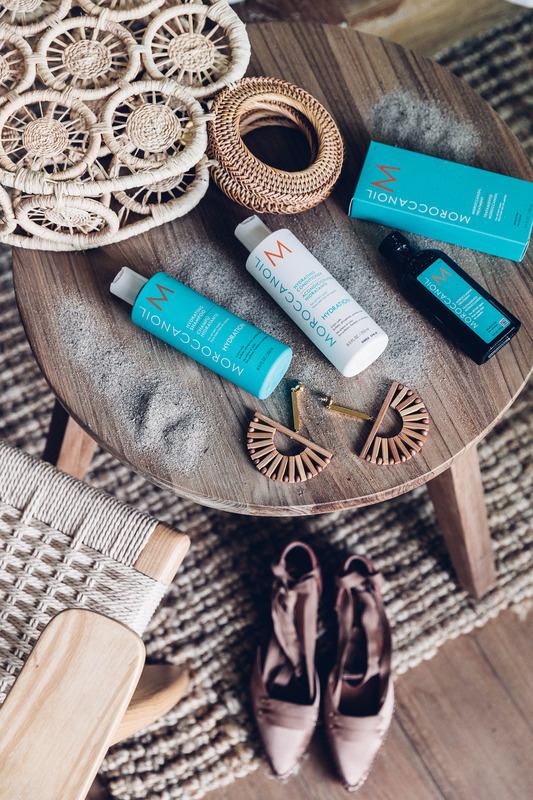 Moroccan Oil Hydrating Shampoo and Conditioner – I typically use different shampoos and conditioners, but when I travel I always go for something hydrating. I don’t know whether it’s different water, dry airplanes/hotel rooms, or excessive heat my hair endures but it tends to get really dry so hydrating shampoo and conditioner are a must. 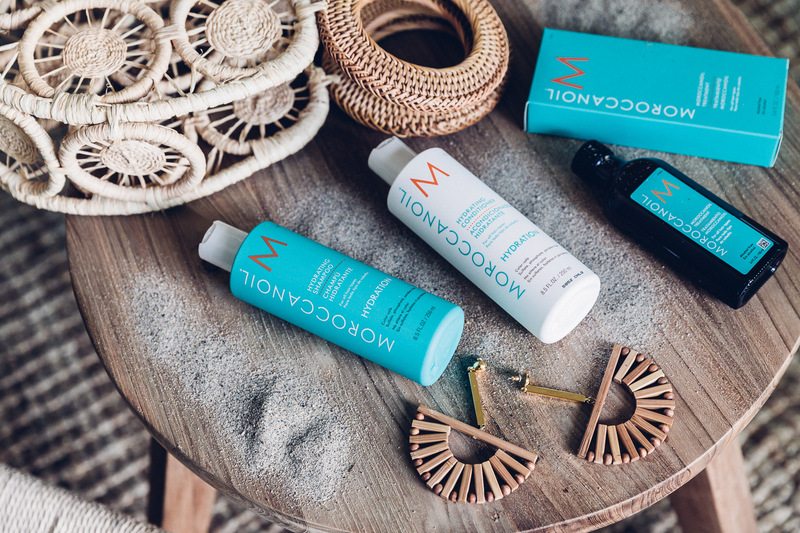 I love the Moroccan Oil hydrating shampoo and conditioner because it gives me just enough moisture without weighing down my hair. Moroccan Oil Treatment – have loved this product for so long and love to travel with it. I like to put a little of it on the ends of my hair to give it a little shine ( I do it either when my hair is wet or when I’m done styling it or both! ). If my hair is extra dry, I like to use it as an overnight treatment and put it all over my hair ( going a little lighter on the roots and heavier on the ends ). Also, when my hands/nails get a bit dry, I use this oil on my cuticles before going to bed. 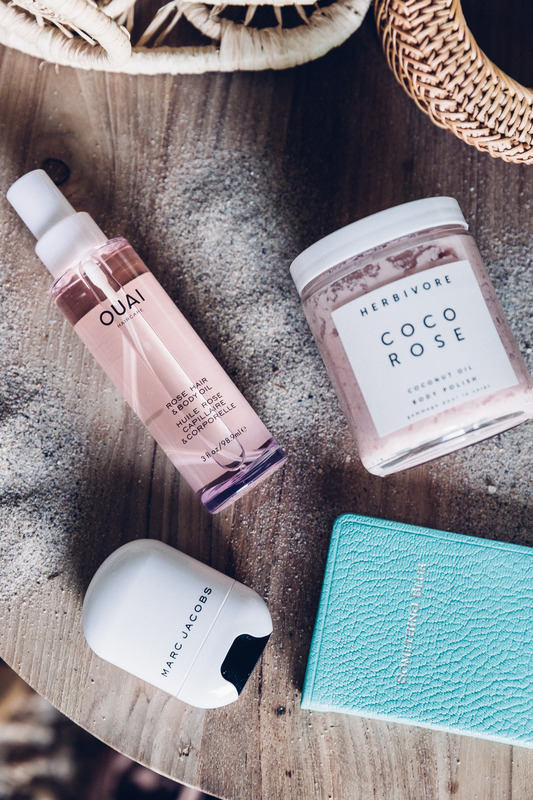 Ouai Rose Hair & Body Oil – love this product so much. I mostly use it on my body. 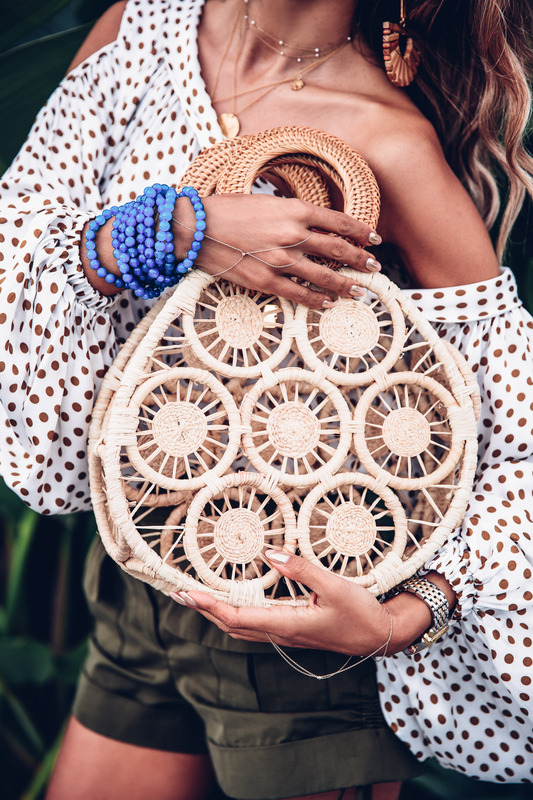 When I was in Tulum about a month ago, I spent quite a bit of time in the sun and this product was perfect to put on after a whole day of laying out and getting my tan on. It’s pure oil so it has no alcohol that dries out your skin which is perfect. This is basically my perfect after-sun product. 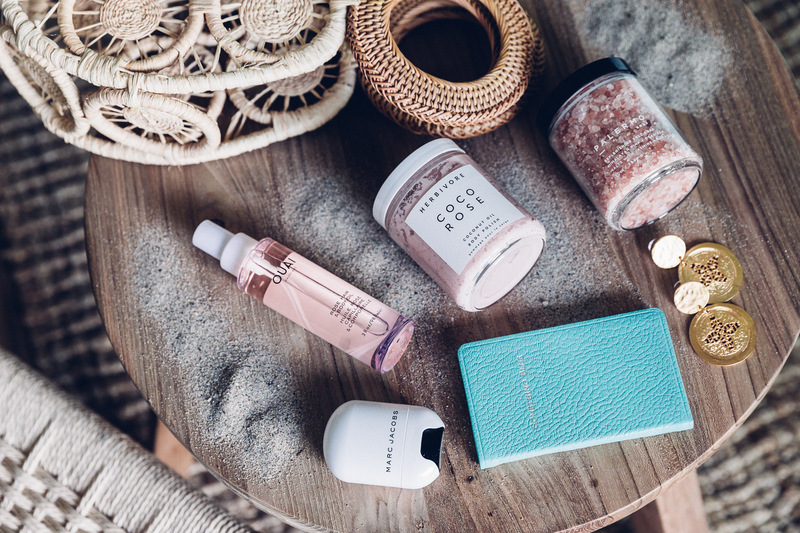 Palermo Body Replenishing Salt Soak – travel days can get hectic at times so to balance out the crazy schedule I like to bring products to give myself a mini spa day from time to time. I love this salt soak because the packaging is travel friendly ( roughly 6-7 uses ), it smells amazing, and it’s a perfect way to add a little something extra to my bath. 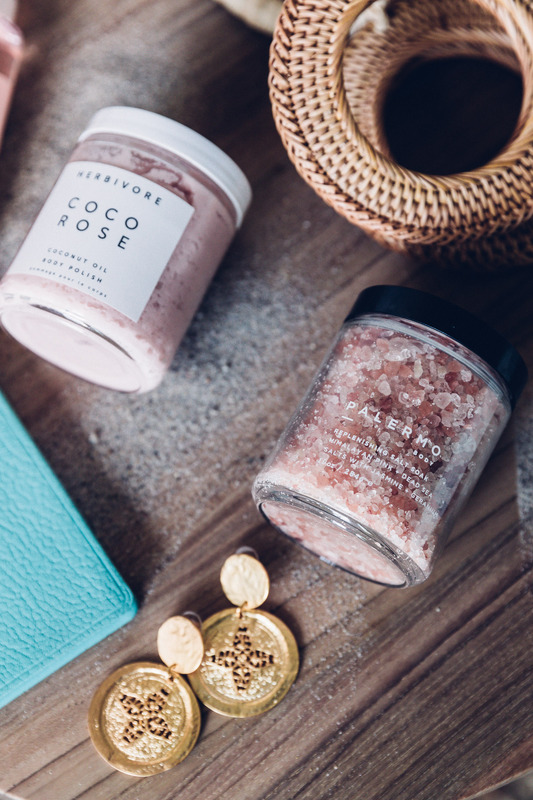 Herbivore Botanicals Coco Rose Coconut Oil Body Polish – I always make sure to travel with a body scrub. Just like my hair, my skin gets dry and a bit rough ( especially in very dry or cold climates ) so exfoliating every once in a while is a must. I recently tried this body polish and I really liked it because it does the job without being too abrasive on the skin. Besides being gentle, it smells so good ( I’ve been obsessed with all things rose for some time now ). 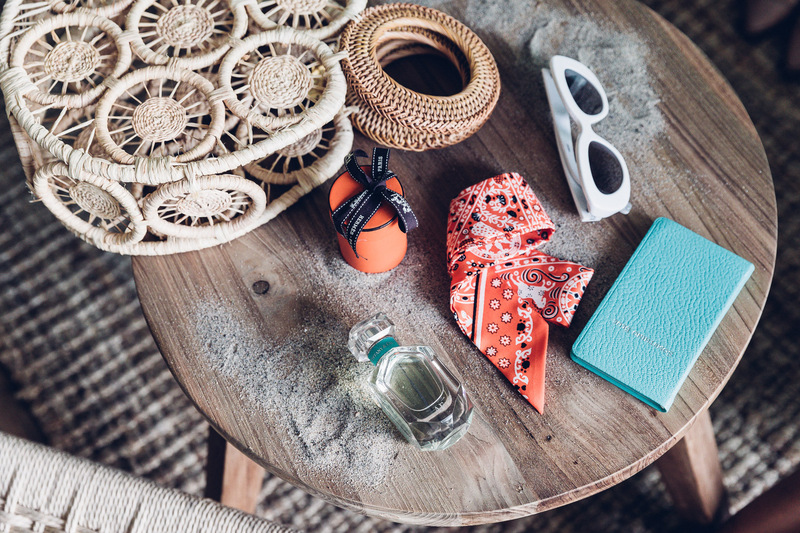 Tiffany & Co. Tiffany Eau de Parfum – I can’t take all my favorite perfumes when I travel so I typically go for a fresh scent that would be appropriate for day, night and anything in-between. 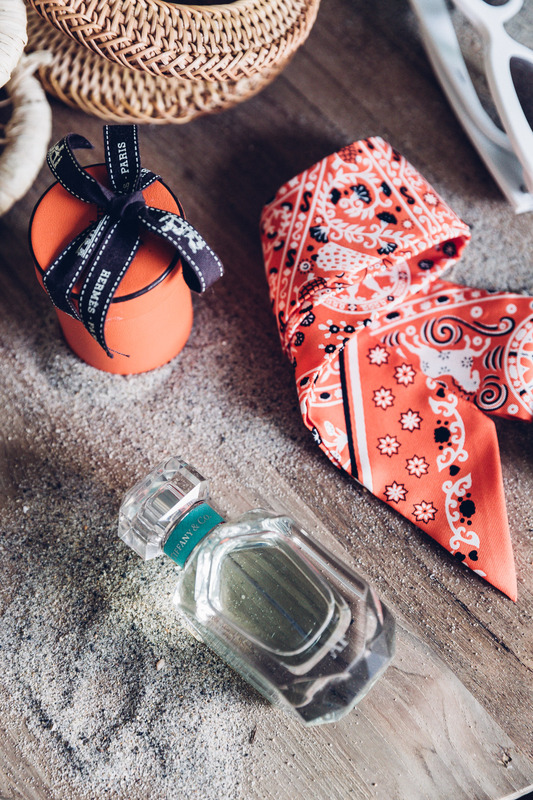 Lately I’ve been loving this Tiffany scent – it’s modern yet sophisticated. It leaves a perfect trace and lasts all day long. Tom Ford Boys & Girls Lip Color – lip colors are totally personal preferences, and I love a coral lip. This Tom Ford one has been my go to – it’s bright enough to show up on my lips, yet it’s pretty sheer and feels really light upon application. Aside from color payoff and consistency, it’s very moisturizing and I’ll take any moisture I can get especially when traveling. Marc Jacobs Beauty Glow Stick Glistening Illuminator – love this illuminator to travel with because of the packaging, so compact and convenient to throw in a purse or a travel bag. Love to use this as a highlighter on my cheekbones and brow bones, inner corner of my eyes, shoulder, collar bone and anything else that needs a bit of glow! Pour Moi Desert Day Cream and Tropical Day Cream – you guys know how much I love Pour Moi Skincare ( I did an entire blog post on it, click here if you want to read it! ). But long story short, ever since I discovered climate based skincare, I can’t travel without it anymore. I never thought how different the needs of my skin are based on where I am and trying Pour Moi products definitely made me realize that.